Hania is the capital city of the Municipality of Hania, with 60.000 inhabitants. They are built at the site of the aqncient town of Kydonia, one of the oldest inhabited areas on the island. Its modern times name was given by the Arabs. In 1252, under the Venetian occupation, the town begun its fortification projects, which were finished in 1590. Hania was the first town in Crete occupied by the Turks, in 1654, until it was freed in 1898, when it also became the capital of the by then autonomous island. Today in Hania, the visitor will distinguish the modern from the traditional parts of the town, which includes areas such as the Top Hana or Topana, the Jewish neighbourhood, the Santrivani, the Spalntzia or Plaza, and the Casteli. Online Travel guide with the best accommodation in Chania Town. Find the cheapest hotels is Chania Town & get exclusive online deals. Great rooms at bargain prices. Book online now! Compare Hotel Prices and read Reviews from others. Great Hotel rates and information See photos, reviews & what's nearby Chania Town . 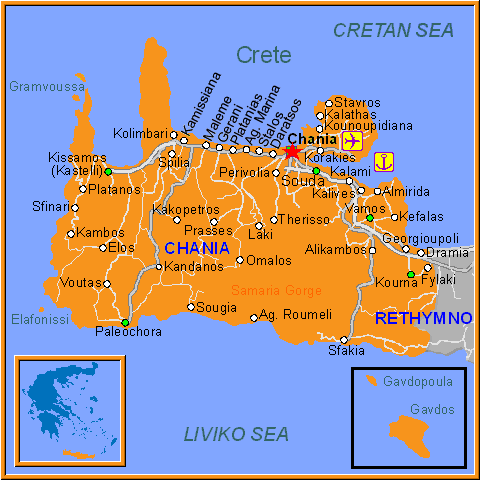 Detailed tourist and travel information about hotels of Chania Town providing also regional information.